Intricate details encompass every inch of this trinket box. 3 1/4" H x 5 1/4"L x 3 3/4"W. Fully lined to protect your precious gems. Chipped when i got it but really cool! 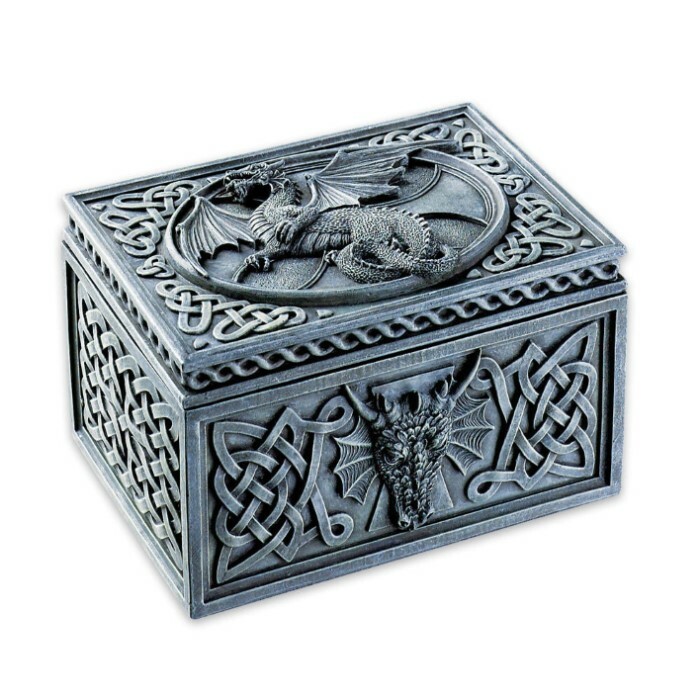 it's a nice looking box one of the coolest things about it is that the dragon is very detailed down to the scales and all and it really stands out. it's also pretty heavy which isnt a bad thing. but it looks great and is much cooler in your hands than in the picture. it is a little smaller than i expected but i didnt really read the size spec's so it serves me right but it's really nice and i'd suggest it if your looking for something interesting and unique. got this for my wife...she loved it..its a nice size and design..also has a pretty good little weight to it to keep it stable and down. i loved it, i orded it for a friend for christmas and I know she will love it too.